HARLEM — Urban Garden Center, located under the elevated Metro-North tracks on Park Avenue had made it through another tough winter. Workers were preparing for a spring sale last Wednesday when a natural gas explosion demolished two buildings just across the street, killing eight people and displacing dozens. Almost a week later, the flowers and plants workers were organizing lay on their sides, crusted over with dust. The fences were broken and most of the inventory destroyed. The shop that was already in desperate need of customers searching for spring plantings was still closed. "It's hard to believe. 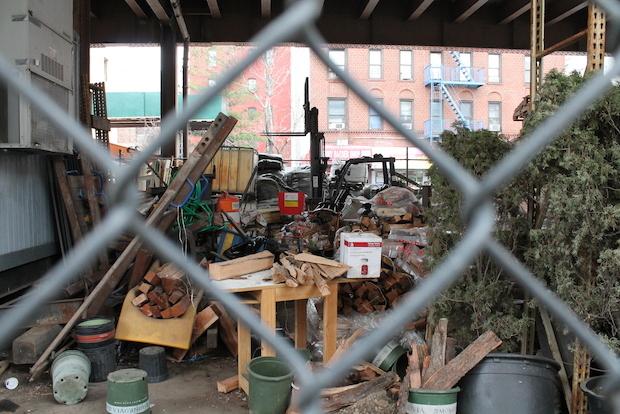 It looked like a tornado ran through there," said Urban Garden Center co-owner Dimitri Gatanas, who has launched a fundraising campaign to restore the shop between 116th and 118th streets, raising $5,600 in a single day. "I'm embarrassed to ask for help, but we are going to need all the help we can to get back open." A few city blocks remained closed on Wednesday, as investigators combed the footprint of the blast for clues about its cause. It's left local business owners worried about their futures as they grieve for people killed by the explosion and collapsed buildings. "We lost friends and neighbors, people we knew by name and others who greeted us with hugs and handshakes," said Gatanas, who said he used to chat in Greek with blast victim Andreas Panagopoulos and, a few years ago, worked next to a booth in La Marqueta where victim George Amaedo sometimes sold Puerto Rican cultural items. "I'm worried about my business, but in reality we have little to complain about," Gatanas said. The area under the tracks has a long history as a center of commerce in the neighborhood. During the 1950s, more than 500 mostly Puerto Rican vendors occupied the nearby La Marqueta space, which runs from East 111th to East 119th streets. In recent years, the city's Economic Development Corporation and the Upper Manhattan Empowerment Zone have invested millions of dollars to try to help revive La Marqueta. HBK Incubates, a food business incubator run by Hot Bread Kitchen, opened in a $1.5 million renovated space at 115th Street. In 2012, Hot Bread Kitchen opened Hot Bread Almacen at La Marqueta, which sells the food made by the entrepreneurs. EDC is also Urban Garden Center's landlord. EDC officials said Urban Garden Center was its only tenant that suffered damage as a result of the explosion and building collapse. The tenants at the market on 115th Street were able to reopen Saturday. "These businesses are anchors of the vibrant East Harlem business environment, and we will continue to develop a plan to aid in their recovery as they return to regular operation," EDC spokesman Ian Fried said. After helping to support rescue efforts by handing out air purification masks and information, Hot Bread Kitchen was able to resume baking bread Thursday, according to a note sent by founder Jessamyn W. Rodriguez. "The bread doesn't wait, and, in light of disaster, sometimes continuing as normal is the only choice," Rodriguez wrote. But other businesses in the area haven't been as lucky, said Raphael Benavides, president of the East Harlem Merchants Association. "Many of the businesses in the area are still non-operational, which mean bills pile up," Benavides said. "We have to try to alleviate the pain." Both of the businesses Mounir Najd owns in the area, The Kiosk, a Moroccan and Mediterranean restaurant on 116th Street between Park and Madison avenues, and Adar Lounge, on Park Avenue between 115th and 116th streets, were closed. The Kiosk was damaged in the blast and the area around Adar Lounge, which opened just two months ago, was closed to traffic. "Things were pretty tough already," said Najd. "It took me six years to get Kiosk going the way I wanted to, now I have to start from scratch. I don't even know if people will come back because they might be afraid." At Armoine, a pizza restaurant on the corner of 117th Street and Park Avenue, the metal corrugated gates remained shuttered and the blinds were pulled because the restaurant's windows were blown out. There was also no heat. Outside the store were metal police barricades and the sounds of trucks removing debris. "We are not really open for business," said Armoine employee Lonnie Mjeshtri. "We have no customers. There's no vehicular traffic. Nothing is happening here." Mjeshtri said the restaurant has remained open primarily for the firefighters, police and investigators in the area to use the bathroom or grab a beverage. "We want to help them any way we can because they are helping us," she said. But she voiced a frustration common among local business owners. "Nobody is telling us anything," Mjeshtri said, saying she's been told nothing about when the area might reopen. Kassandra Perez, from the Mayor's Community Affairs Unit, told Community Board 11 that the city's Department of Small Business Services was "doing outreach" to affected businesses in the area. CB 11 President Matthew Washington said a timeline for when the area might reopen was difficult to hash out because of the ongoing investigation. The board has connected business owners to various city agencies for help. "Those are real needs," Washington said of the business owners. In spite of the circumstances, business owners like Najd and Gatanas remain optimistic about their long-term prospects. "I do have hope and I don't think I will be closed permanently, but it will be hard to get these businesses back on their feet," Najd said. The city will carry on with plans to revive commerce in the area. Last week, EDC released a request for proposals to improve pedestrian safety and add streetscape improvements, build a new public plaza and transform an abandoned comfort station underneath the tracks at 125th Street and Park Avenue for commercial use. Gatanas said he's planning on ramping up community events that have helped make Urban Garden Center popular in the area, such as the summer pig roast known as "El Boar-rio" and the flea market nicknamed Flea Marqueta. "We wanted to play a role underneath these tracks and help reinvigorate a neighborhood," said Gatanas. "We have no plans to close, no plans to move. After this, we love East Harlem even more."